The Terriers are planning a return visit to Washington D.C., the site of BU's dramatic 4-3 overtime win over Miami in the national championship game (just in case you forgot). Next month, the 2009 NCAA champs will reunite for a visit to the White House, following an invitation to meet President Obama. The date is still TBD, but will be reported here as soon as it is finalized. Blog contributor Sean Pickett has posted on YouTube highlight videos of BU's Frozen Four wins over Miami and Vermont in true HD. Those links are below along with another for a short clip of BU's 3-goals- in-44-seconds outburst against BC in the Hockey East semifinal. Remember to click the HD button before clicking the full-screen button. One more honor for Colin Wilson, who has been named 2009 College Player of the Year by USA Hockey. A first team All-American, Wilson also was named College Hockey News' Player of the Year. Former Terrier Chris Bourque scored a short handed game-winner as the Hershey Bears clinched the AHL’s Eastern Conference Championship with a win over Providence in game five of their series. Bourque has a 4-14-18 line in 16 playoff games following a 73-point regular season. Kevin Schaeffer played in five post-season games for Providence, while Jason Lawrence, who signed an ATO with Providence last week, did not dress for any games. The Terrier Hockey Fan Blog has arranged for a third and final Coach's Mailbag with Terrier Head Coach Jack Parker. The 2008-2009 Spencer Penrose Award winner as NCAA Division 1 Coach of the Year had previously answered questions for our readers back in September and again in January. If you have a question to submit, please e-mail it to buhockeymailbag@comcast.net by Tuesday, May 26. We'll do our best to include as many submissions as possible. Jason Lawrence, following a career season at BU with 25 goals and 39 assists, has signed an Amateur Tryout contract with the Providence Bruins. The P-Bruins are currently in the AHL Eastern Conference finals, tied at game apiece with Hershey. Last weekend, Colin Wilson met the Nashville media for the first time since signing a multi-year contract with the Predators. Wilson, who led Hockey East in scoring while earning First Team All-American and All Hockey East honors, covered a number of topics including how his return to BU for his sophomore season helped him to improve his game and mature off the ice. Terrier co-captain John McCarthy was one of five BU student-athletes to be awarded The Scarlet Key, one of BU's highest academic honors. McCarthy, who signed a professional contract with the San Jose Sharks after enjoying his best scoring season as a Terrier, graduated last week with an economics degree from the College of Arts and Sciences. Freshman Ross Gaudet’s brother Chad is a standout midfielder for Virginia’s lacrosse team, which plays Cornell in the NCAA semifinals this Saturday at Gillette Stadium in Foxboro, Mass. Jason Lawrence talked with BU Today about his four-year Terrier career. Both Tom Poti of the Washington Caps and Ryan Whitney of the Anaheim Ducks were eliminated from the Stanley Cup Playoffs when their respective teams lost in the conference semifinal series. But John Curry has been called up to the Penguins who are playing Carolina in the Eastern Conference final. Two former Terriers remain in the hunt for the AHL’s Calder Cup. Chris Bourque of the Hershey Bears is facing off with Kevin Schaeffer and the Providence Bruins in the Eastern Conference final. The series is tied at one game apiece. Bourque has a 2-11-13 line in 13 playoff games. Bryan Miller and the Alaska Aces take on the South Carolina Stingray, beginning this Friday, in the ECHL’s Kelly Cup Finals. Miller, who was an All Hockey East defenseman in 2004-05, has 10 post-season points following a 40-point regular season. ► Milestone Goals & Games—a growing list of memorable moments from BU hockey history, beginning with a collection of clips from blog contributor Sean Pickett. ►2007-08 Game Highlights—highlights from 8 games (more to be added), including the Red Hot Hockey matchup with Cornell at Madison Square Garden and back-to-back overtime wins against Maine. Senior co-captain Matt Gilroy, named 2009 Hobey Baker Award winner the day before BU’s 4-3 overtime win against Miami in the national championship game, officially received the trophy as college hockey’s top player on Thursday at the the Hobey Baker Awards Banquet in St. Paul, Minn. Terrier Head Coach and NCAA Coach of the Year Jack Parker attended the event with Gilroy, who will graduate from BU on May 17 before beginning his pro career with the New York Rangers. 2011 recruit Charlie Coyle scored a hattrick for the Cape Cod Whalers in an 11-0 win against the Boston Jr. Ranger in the New England ProAm Pre-Draft Showcase. A 6-2 right wing who plays for Thayer Academy, Coyle has a 3-2-5 line after two games. He was assisted on two of the goals by Tom O’Regan, Jr., son of 1982-83 BU co-captain, Tom O’Regan. The younger O’Regan, who has a 1-3-4 line thus far and is among the top New England prospects for 2011 plays for St. Sebastian’s, which recently named former Harvard defenseman Sean McCann as its new head coach. Justin Courtnall’s third goal of the RBC Cup tournament gave Victoria a 2-1 lead in its semifinal matchup with Humboldt, but the Broncos added two more goals to eliminate the Grizzlies. Courtnall is the son of former NHL star Geoff Courtnall, who is the Grizzlies’ coach. 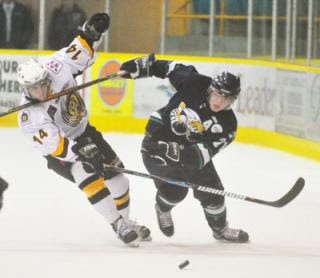 2009 recruit Justin Courtnall scored a pair of goals and added an assist in the Victoria Grizzlies' 6-3 win over Summerside in the round-robin portion of the RBC Cup Tournament, hosted by the Grizzlies. With the win, Victoria clinches a spot in the tournament semifinal on Friday. Courtnall, a 6-3 left wing who was drafted in 2007 by Tampa, scored 63 points (22-41) during the regular season, then added six more in the BCHL playoffs. He has a 2-4-6 line in RBC Cup play. Terrier co-captain John McCarthy has signed a two-year entry level contract with the San Jose Sharks, who had drafted him the seventh round of the 2006 amateur draft. 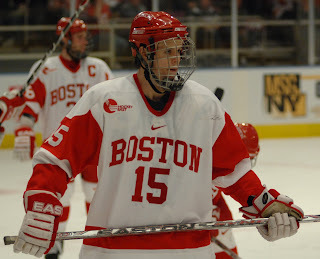 McCarthy, a football and hockey star at St.John’s Prep in Danvers, Mass, spent a season with the Des Moines Bucs before beginning his Terrier career. Like all the members of the senior class, McCarthy put up career-best numbers during the Terriers’ run to the NCAA title with a 6-23-29 scoring line and had a goal and six assists in BU’s nine post-season games. The Daily Free Press recently looked back at memorable games during the Terriers’ championship season. Co-captains McCarthy and Matt Gilroy were among the honorees at the recent Boston University annual student-athlete awards reception. Gilroy received BU’s top award for a male athlete, the Mickey Cochrane Award named for the major league baseball Hall of Fame catcher, who played baseball, football, and, occasionally, hockey at BU. McCarthy was the men’s recipient of John B. Simpson Award, presented to senior who has demonstrated enthusiasm and leadership. The Terriers were honored at Fenway Park during the April 26 Red Sox-Yankees game with Head Coach Jack Parker throwing out the first pitch. To order a DVD of the 2009 NCAA championship game, click here. Inside College Hockey’s early projection for next season’s top ten teams has the Terriers in the #3 spot. The Miami RedHawks, whom BU defeated in the national championship game, is ranked first, followed by Denver. Lowell, at #9, is the only other Hockey East team in the projection. 2009 recruit Justin Courntall had a pair of assists in the Victoria Grizzlies’ 5-0 win against Kingston in RBC Cup round-robin play. Former Terrier defenseman Bryan Miller has scored 8 points (1-7) in 10 post-season games for the ECHL Alaska Aces. Miller scored 40 points during the regular season (10-30), a career high as a pro and second best on the Aces. Miller was briefly called up to AHL Peoria during the season. Former Terrier teammates John Curry and Chris Bourque are opponents in the second round of the AHL Calder Cup playoffs. Bourque's Hershey Bears have two games to none lead over Curry's Wilkes Barre/Scranton Pens in the Eastern Division finals. 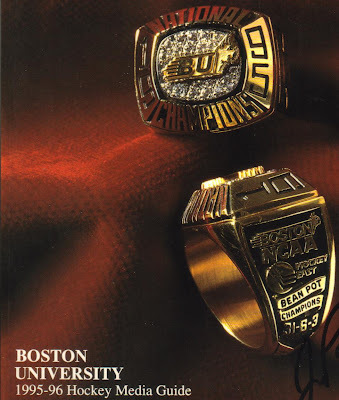 Blog contributor candycanes99 has put together a 10-minute highlights video of BU's 6-2 win over Maine in the 1995 NCAA Championship game. Look for more video highlights from milestone BU games to be posted in the near future.